Experimental Ebola Vaccinations, Considered 'Paradigm Shift,' Begin In Congo : The Two-Way The vaccine is still unlicensed but has passed drug trials with flying colors. 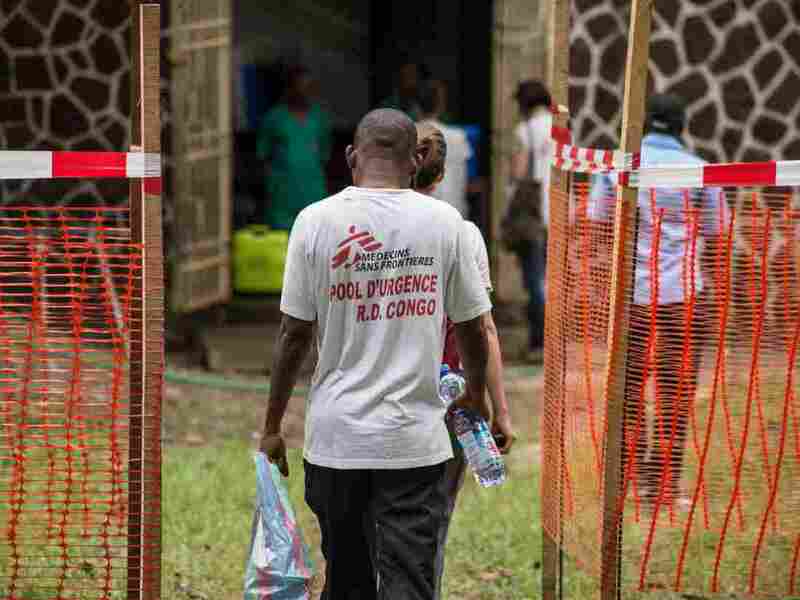 Authorities have begun administering thousands of doses in the Democratic Republic of the Congo to fight the outbreak. Doctors Without Borders staff enter an Ebola security zone at the entrance of the Wangata Reference Hospital in Mbandaka, in the Democratic Republic of the Congo. Health workers have unsheathed their experimental new weapon against the Ebola virus in the northwest reaches of the Democratic Republic of the Congo. On Monday, the World Health Organization, together with local and international partners, began administering Ebola vaccinations in the region, where at least 49 suspected cases have been reported since early April and at least 26 people are believed to have died. More than 7,500 doses of the rVSV-ZEBOV — which is still unlicensed — are now available in the country and 8,000 additional doses will be available soon, according to WHO. Health workers in the bustling port city of Mbandaka and the remote village of Bikoro have already begun to receive their vaccines. The effort marks the first widespread use of the vaccine since inaugural tests in 2015, toward the end of the massive outbreak in West Africa. That epidemic killed more than 11,300 people across three countries between March 2014 and June 2016. But of the thousands of adults who received the vaccine during the trial, not one became infected. Add to that number some 8,000 volunteers tested in Africa, Europe and the U.S., and WHO says "the estimated vaccine efficacy was 100%." It has yet to be officially licensed, but authorities have obtained special permission to use it in the latest outbreak. "Use of the VSV-EBOV vaccine marks a paradigm shift in how we fight #Ebola," Peter Salama, WHO's deputy director-general for emergency preparedness and response, tweeted on Monday. "This is an important moment that changes the way we've seen Ebola for 40 years." The areas with red markers represent the major regions where people were confirmed dead of Ebola during the 2014-2016 outbreak in Guinea, Sierra Leone and Liberia. The areas with blue markers represent Bikoro and Mbandaka, the two places in the Democratic Republic of the Congo with confirmed cases of Ebola in the 2018 outbreak. Still, health workers remain unnerved by the Ebola outbreak's recent spread to Mbandaka, where four cases have been confirmed. Unlike the site of the first reported cases, Bikoro, which is a small village over 10 hours by car from the nearest airfield, Mbandaka has a population of more than 1 million people perched on the Congo River. The city's congestion and connection with other regions potentially makes it a much more dangerous launch pad for a deadly disease spread primarily through direct contact with the blood or other bodily fluids of infected people. So WHO, the country's Ministry of Health, Doctors Without Borders and other groups are embarking on what's called a "ring vaccination." "Basically making a ring around a person who has tested positive and then making a second ring — so contacts of contacts," WHO spokesperson Tarik Jasarevic, who was vaccinated himself as part of the drug's trial run, explained to NPR's Don Gonyea on Sunday. "Also, those who will receive vaccination are health workers and the responders. So we consider that for each confirmed case of Ebola, there will be between 100 and 150 people who will be eligible for vaccination." Funeral workers will be among those vaccinated, as well. Karsten Voigt of the International Federation of Red Cross and Red Crescent Societies has been training volunteers specifically on how to handle bodies during burials. Community burial practices in West Africa were one of the prime drivers of the disease's transmission in the 2014 outbreak. "A dead body has a very high viral count," he told NPR's Scott Simon. "It is very dangerous to touch the body or to move around in the house where this person has died. So the volunteers, Red Cross volunteers, who conduct this work have to be protected. They wear their protective kits, and they have been trained on how to deal with this body." Hopes are high that this new weapon will have a powerful impact in the fight against Ebola. But memories of the massive outbreak just years ago — and the lessons that came with them — remain fresh in the minds of residents. "I tried to greet a friend by shaking hands and he said: 'No, did you forget that Ebola is here?' " a local teacher told the BBC. "They forbid people to greet by using hands, eating animals from the forest, and people are now living with fear."